I did it all for the cookie(s)! I need an elf. Like a real, live, breathing, HELPING elf (Sorry Duncan! 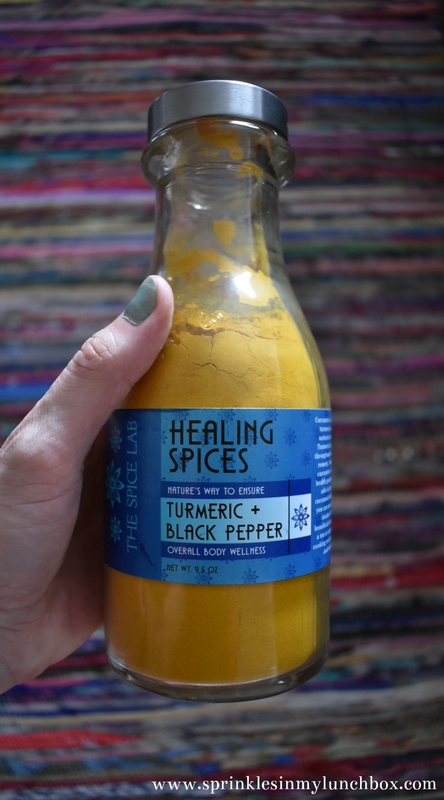 I still love you, but you are stuck in a Mason jar right now and obvi cannot help.). I need one that can follow simple instructions, like cleaning cookie sheets or rolling dough into balls and coating the with granulated sugar. Yesterday was Christmas Cookie Baking Saturday. And I was exhausted. I still sort of am. 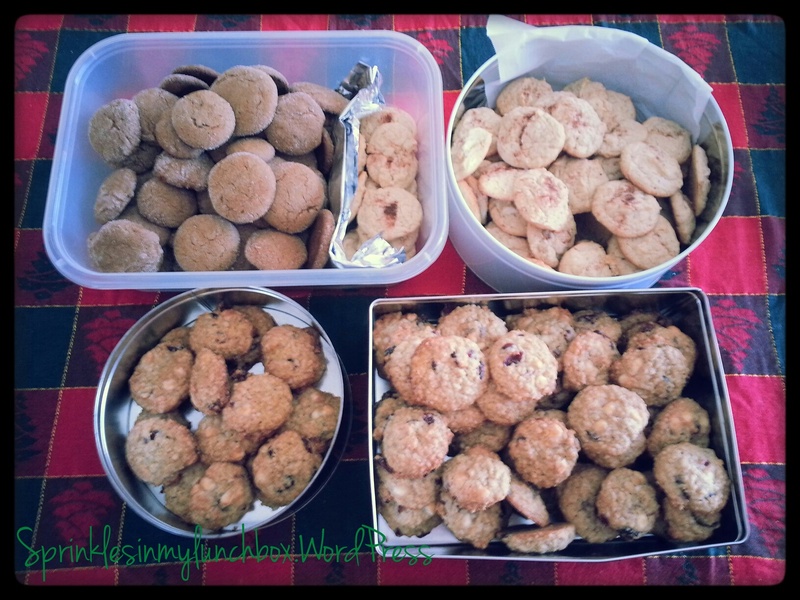 Yesterday yielded 225 cookies. 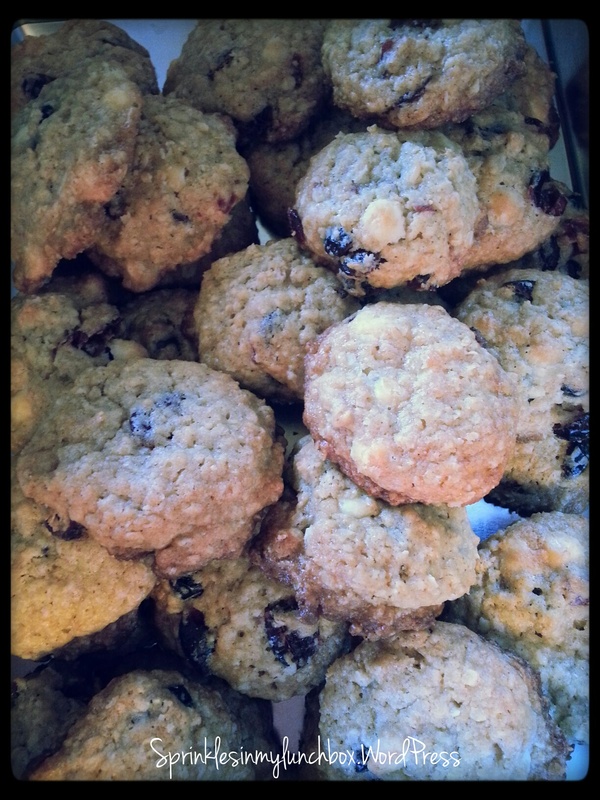 The ones I chose to bake this year were White Chocolate Cranberry Oatmeal, Ultimate Ginger, and Eggnog Cookies. I really wanted to go with a theme – a classic Christmas flavor theme. I love a theme! My day started with getting the boys up (Just kidding. They woke me up with their “I’m-ready-to-get-up signaling noises”.) After breakfast, it was all about the cookies! I went through several pounds of butter. Isn’t it therapeutic to watch butter sticks melt? Oh. Just me? 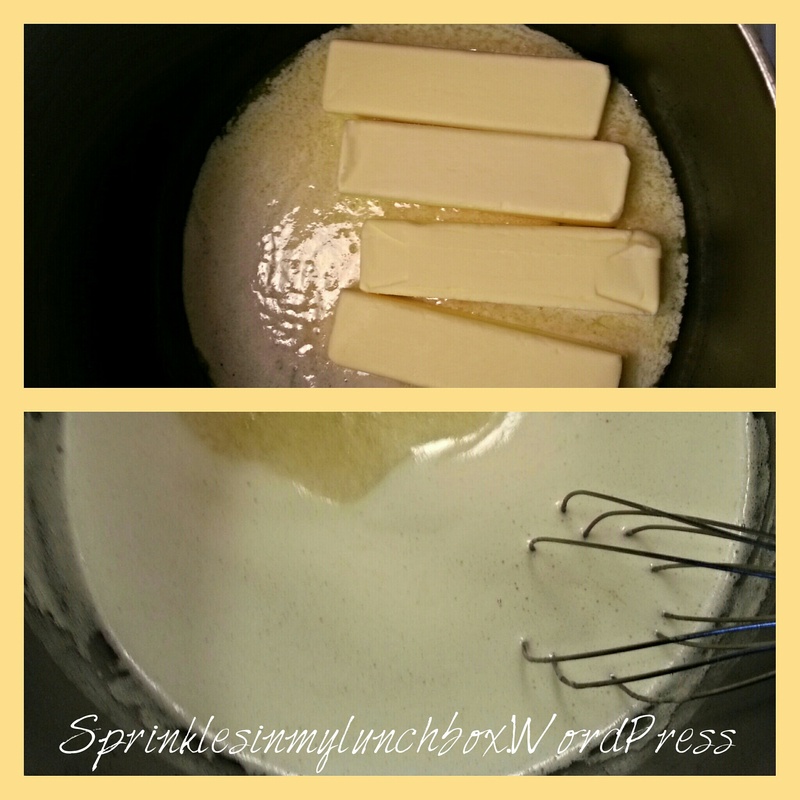 I love the smell of melting butter, too. It’s heavenly. 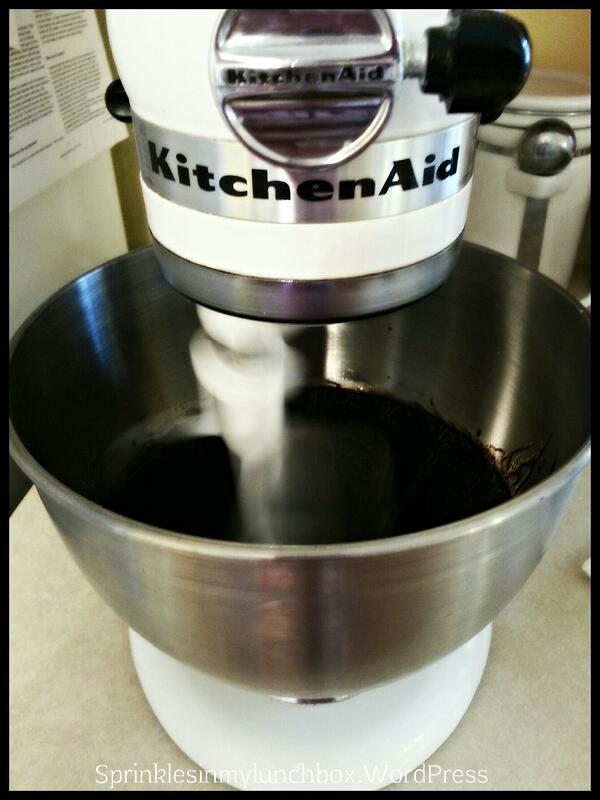 My right-hand-helpers (no thanks to Duncan), my Kitchen Aid stand and hand-held mixers, were very busy, whirring and stirring for hours. I made the batter for the White Chocolate Cranberry Oatmeal Cookies first, as it had to sit in the fridge for two hours. 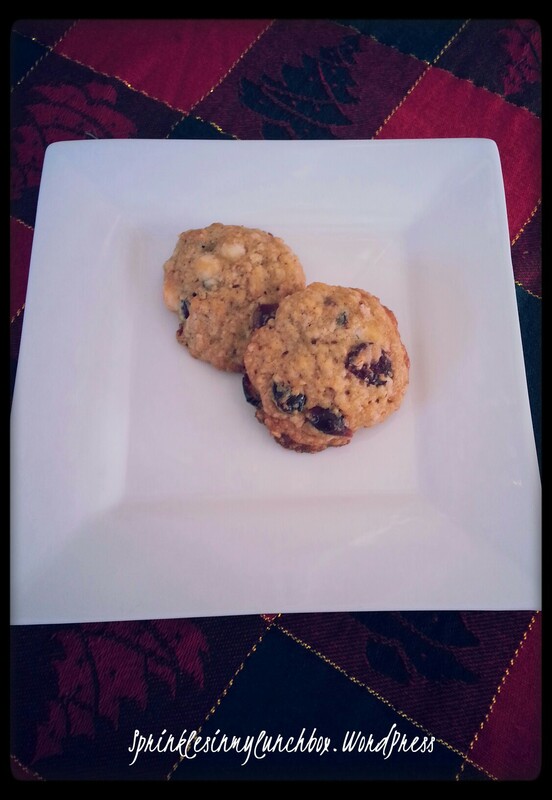 When I finally did bake them, they came out perfectly – browned on the edges and bottoms (due to the one pound of butter in the doubled recipe), cranberries glistening, oatmeal giving off the perfect amount of chewiness, and the white chocolate offering up little pockets of creamy sweetness. 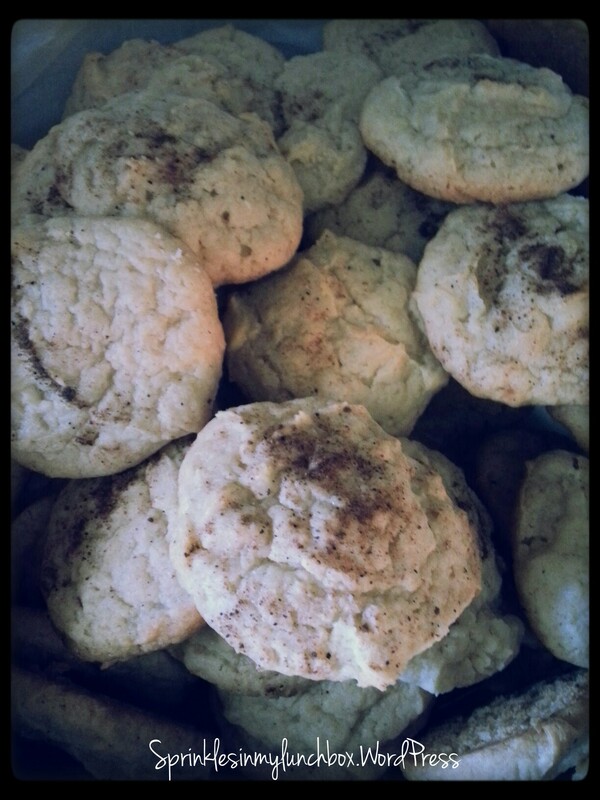 The Eggnog Cookies were next. These were an easy-peasy recipe to use. I love how they turned out. 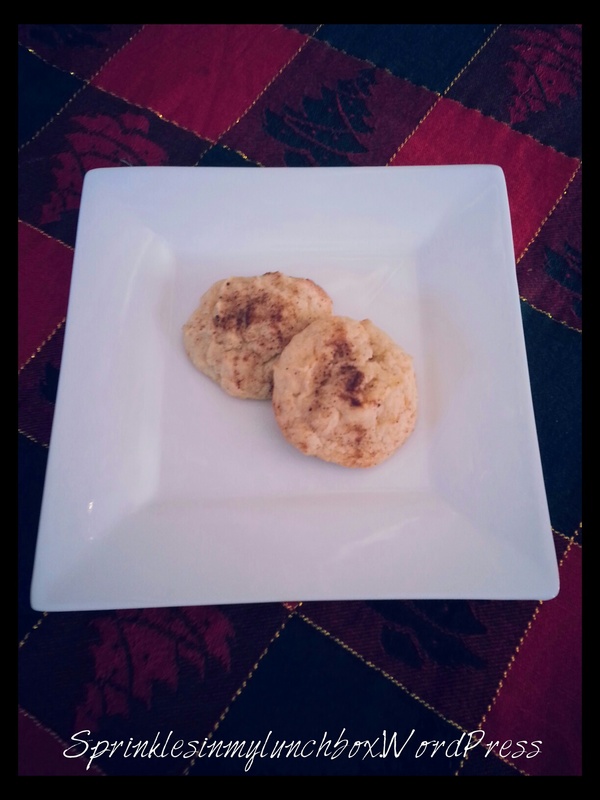 They are very simple, letting the true flavor of eggnog shine through. 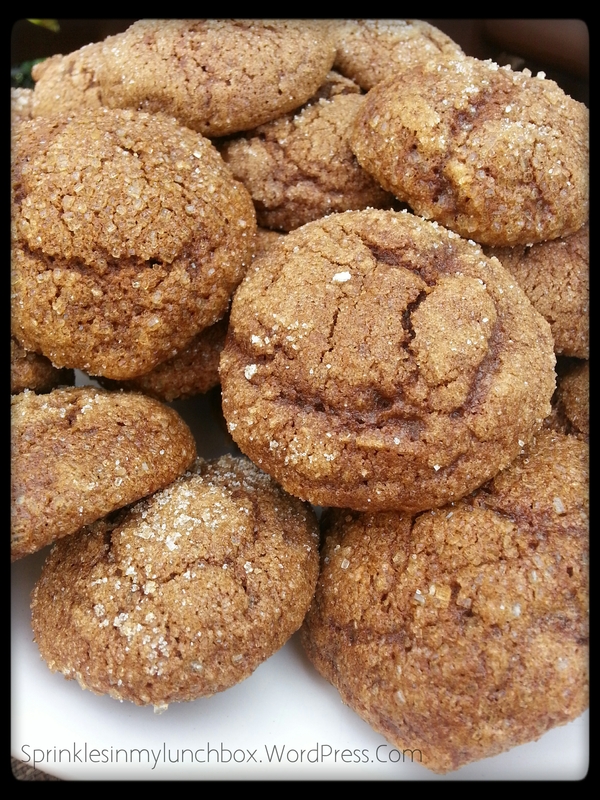 Sprinkled with extra nutmeg, these little sweeties are sure to conjure up lovely holiday memories! My kids and I have gone through at least 2 gallons of eggnog this season so far. It’s so delicious. Bigs calls it “Santa Milk” since some of the jugs of it have Santa on them. I love how kids see things so differently from us old, haggard, jaded adults. 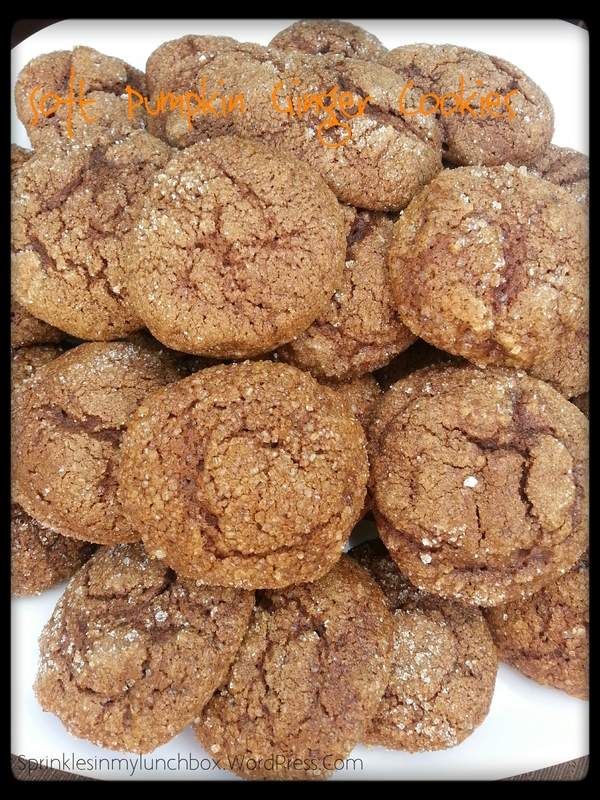 Next and lastly were my Ultimate Ginger Cookies. 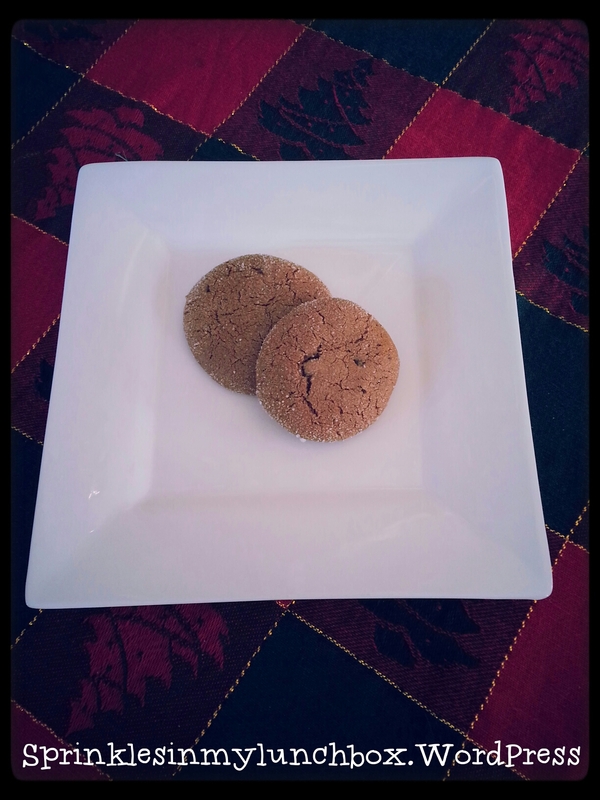 I love love ginger cookies. I think you know that, by now. 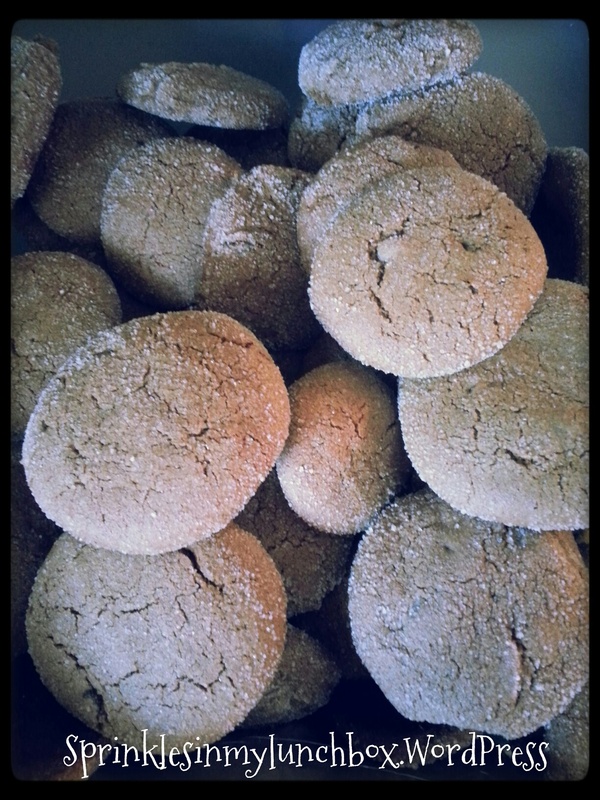 This is the second year in a row I’ve done a variation on a ginger cookie. 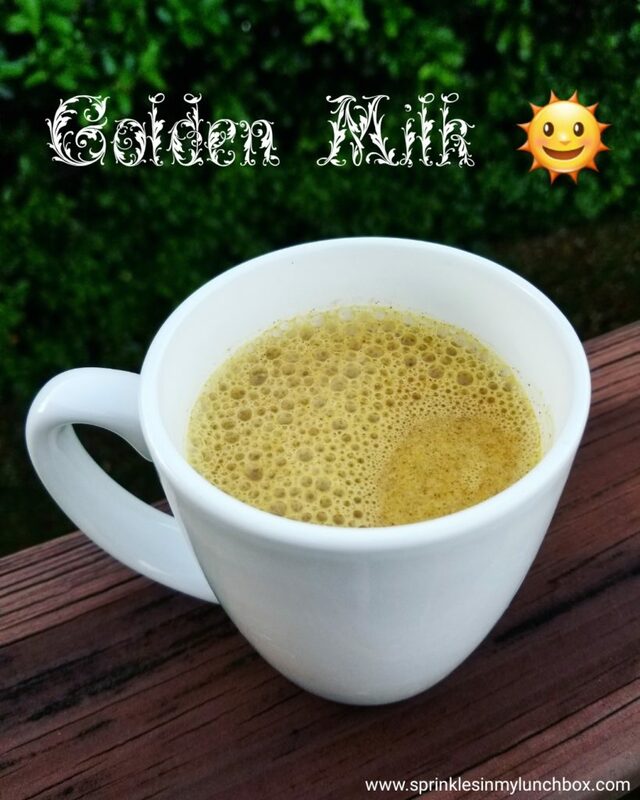 These came out delicious! I love Ina Garten’s addition of crystallized ginger. I love how rolling the dough balls in granulated sugar before baking returns a crunchy, but chewy and soft, cookie that looks like it’s been sprinkled with icy snow. All of them, together, in harmony, on a plate. 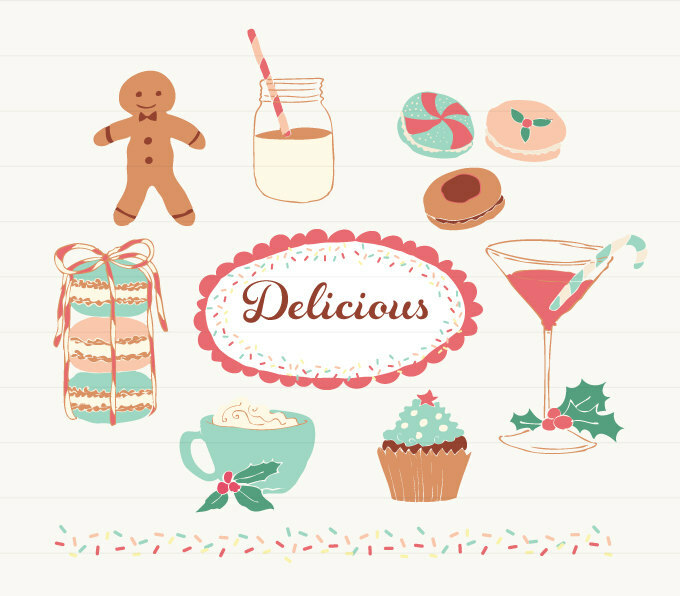 The beautiful flavors that epitomize the season – eggnog, ginger, cranberry. 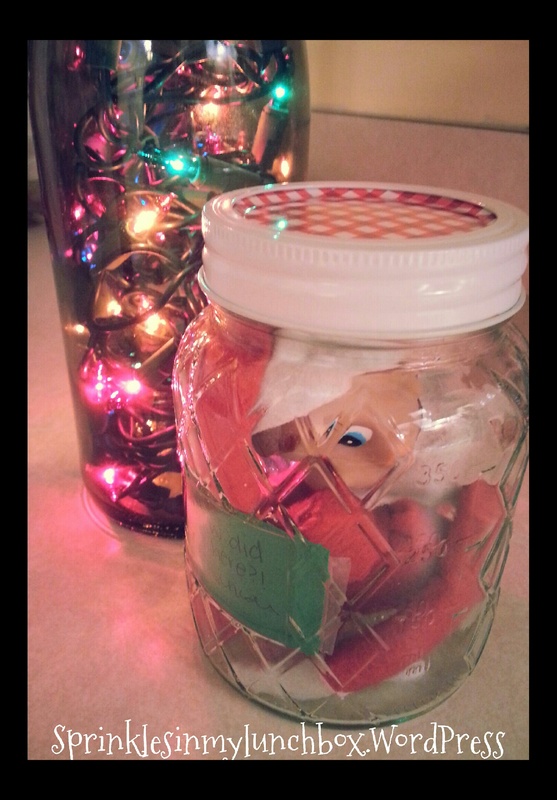 These sure would have been a lot easier to make if that elf would have helped! And, sadly (but not really sadly, for this is the purpose! ), for as much time as I put into them, these cookies got packaged up (neighbors, teacher, friends, church family, mom group) and doled out quicker than I could say “YULE LOG!!!”. All I’ve got left is crumbs. That’s okay. That’s what it’s all about. 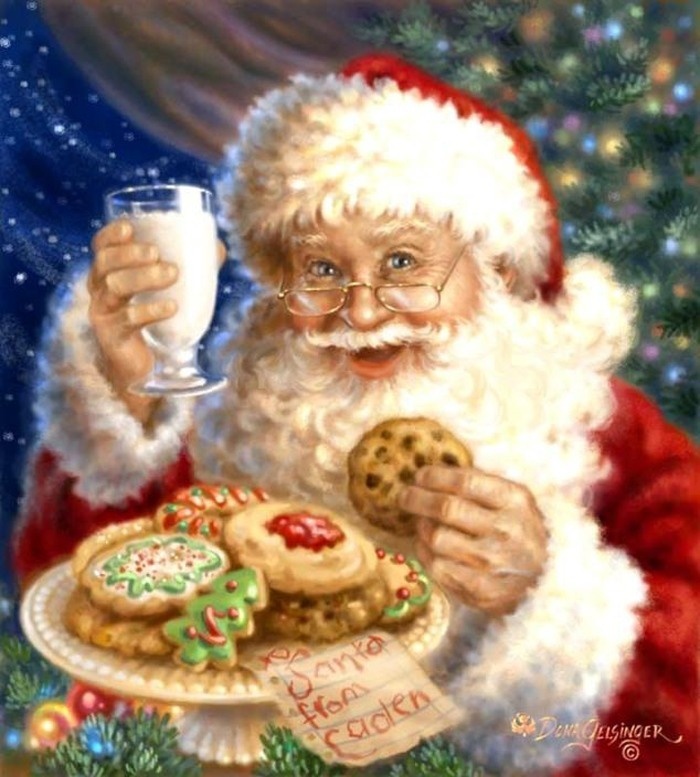 I’m sure we’ll receive lots and lots of cookies from other people…right?! Are you cookie-making friends listening?! 😉 I jest (sort of). 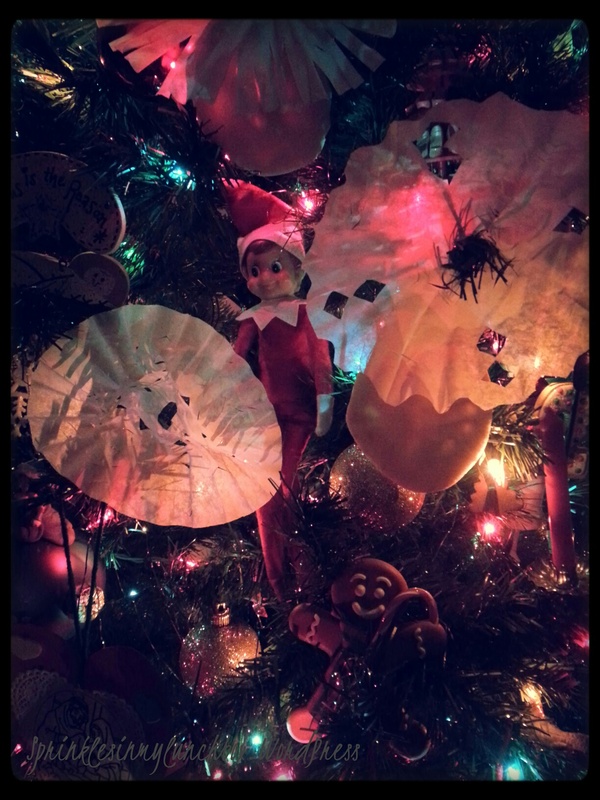 Speaking of that elf, he’s been in several different spots since we last spoke. He’s made a mess of toothpaste. Thanks for THAT, Dunc. He’s crammed himself into a mason-esque jar. It wouldn’t so creepy except that I had an almost-too-small jar and I had to sort of almost damage Duncan’s neck to get him in there. Oops. And he made coffee filter snowflakes! 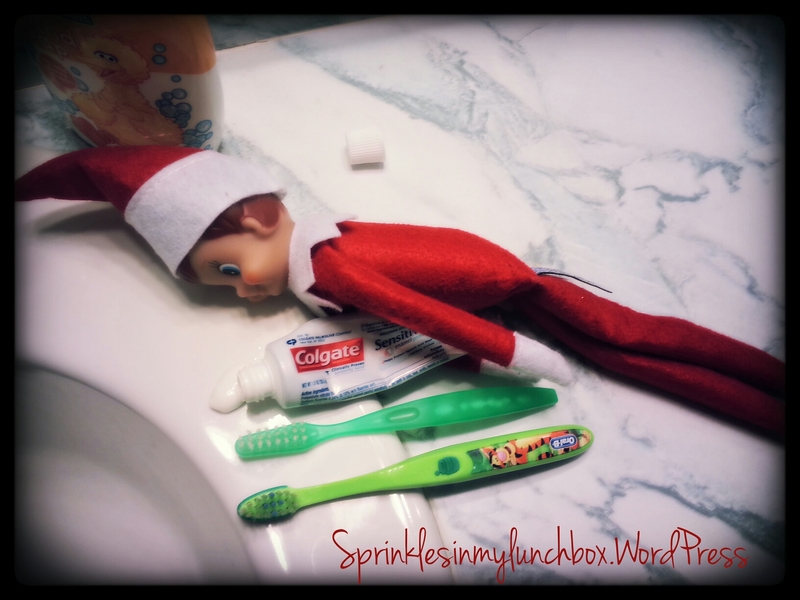 What a clever elf he is! Well, we’ve been very busy in our house, not only baking cookies (me) and wrapping gifts (me), but indulging in the traditions of the holiday (all). Bigs watched “The Polar Express” last year, but didn’t care so much (or understand). At three and a half, he now gets it and LOVES it! I pulled out some old Christmas books I had as a kid (and saved…they are in muy delicado condition, I’d say!) and we’ve been reading those, too. 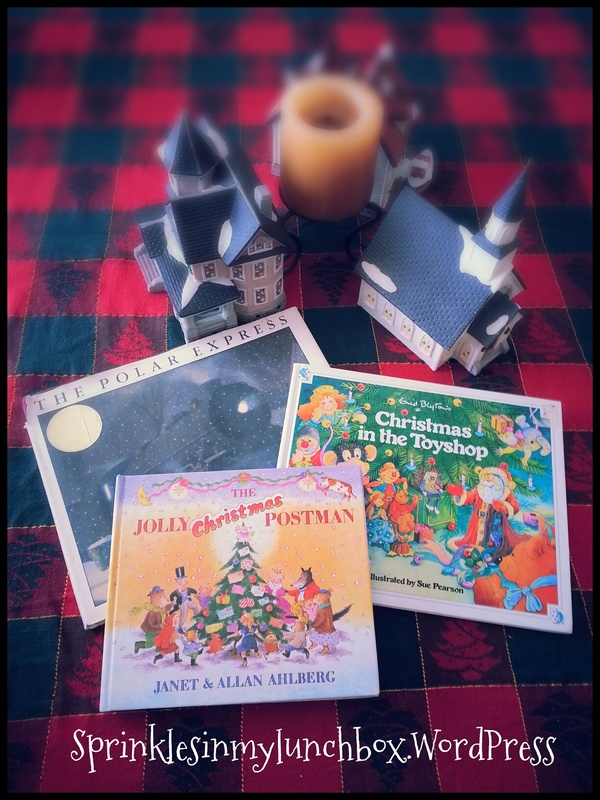 If you haven’t seen or read The Jolly Christmas Postman by Janet & Allan Ahlberg, you MUST. It was one of my favorite books as a child. It is adorable. And Bigs now tells me that all he wants for Christmas is a new water bottle. Not a bouncy carrot. Great. Well, I’m sure he’ll forget he reneged on that and enjoy the dog toy shaped like a carrot that Santa is bringing him. So, off to church – the second Sunday of Beautiful Advent. Have a very sweet, blessed Sunday. 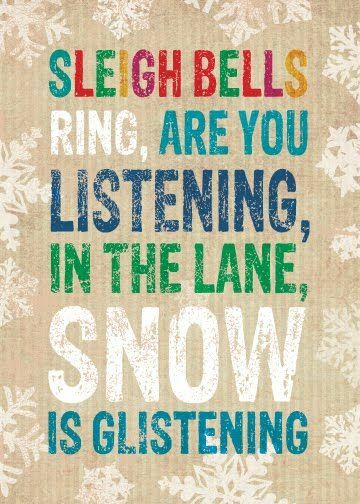 Sleigh bells ring! Can you hear them? If you squint (I have to squint to see practically anything and you know what? When I’m trying to listen really hard, I squint then, too. I’m too young for such problems!!) and listen really hard, you can probably hear them! It’s so close! Christmas is so close! Can you believe it?! It is just slightly over four weeks away! 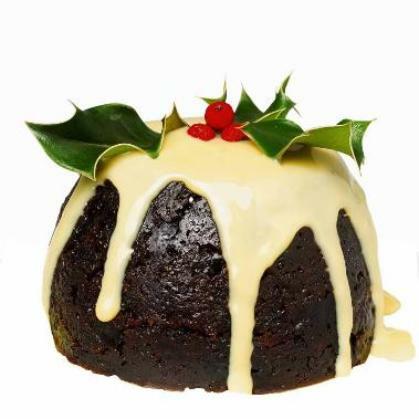 That’s only four weeks to shop (and to write Santa) and to plan your baking and cooking and to celebrate Jesus and the Advent. Oh. And to get that dreadful Elf out of the back of your closet. I almost forgot. Oops. I love him, I do. He’s part of our family now. Duncan is very sweet, you know, for a pretend elf filled with cotton stuffing and wire. It’s just that I have to think of so many different things for him to do each night! And I’m just so tired at the end of the day! It’s okay though. Truly, if it makes Bigs and Smalls happy, then I am happy. I’ll rally. I can man up. Thank goodness for Pinterest – it does most of thinking for me on this one! I know that for me, getting this close to Christmas means that I lots of wrapping to do, cookies to bake, four beautiful Advent church services to attend, Christmas themed kid lunches to dream up and make, Christmas parties and playdates to enjoy and lots more. Busy busy busy. I don’t know how I’ll do it. Some days (every day?? ), the energy just isn’t there. But the spirit of Christmas will keep me going! 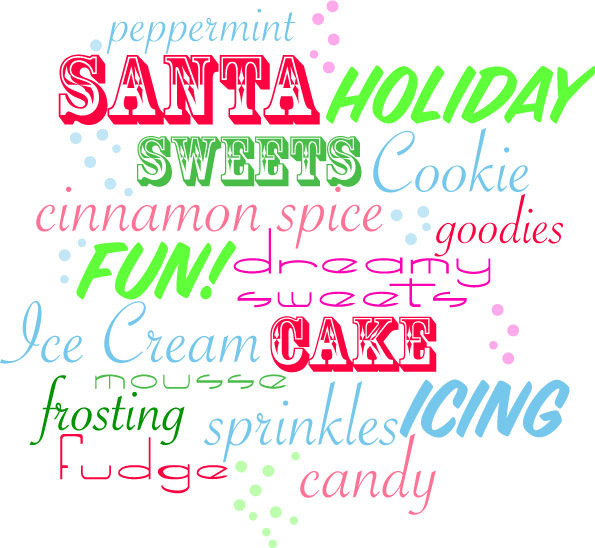 What will you bake to bring to your Christmas or holiday parties? 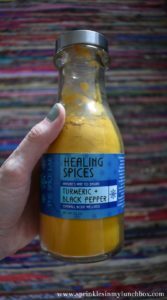 Perhaps I can share some grainy (lol) pictures and a few recipes? I love baking for the holidays. I love finding new recipes and trying them out. I don’t think I’ve made the same thing twice. 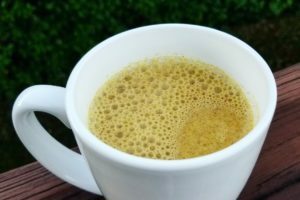 It seems like every year, there are so many new and exciting recipes to try. 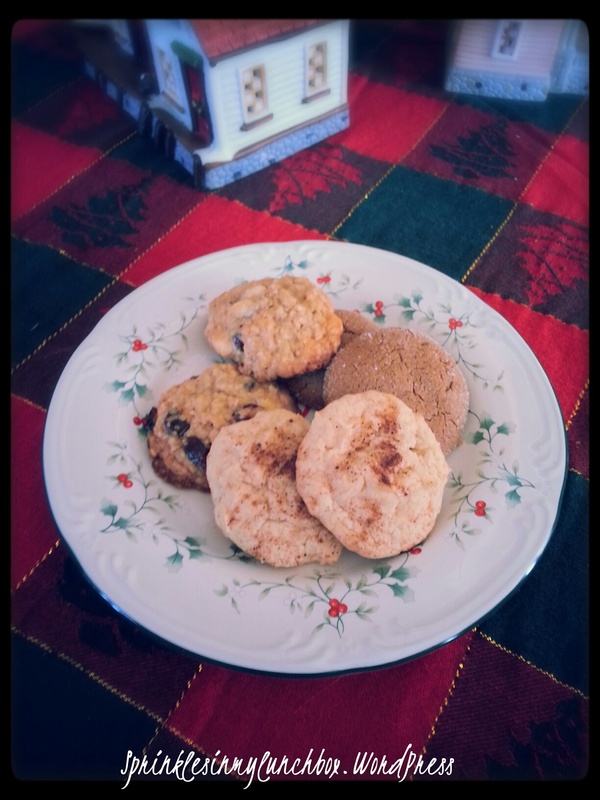 I used to try to make about 5 different kinds of cookies, but as my children have grown, my time to devote to such things has lessened, and so has the variety of cookies I make. But that’s okay! The ones I DO bake, hopefully, make up for the lack in assortment. And I enjoy making cakes and bars, as well. Those are more for the parties rather than the cookie tins, but fun, nonetheless. I also like to try new recipes for those each year. I ADORE fresh cranberries. They are so deliciously tart. I love their shiny, red coat and their delightful pop when eaten. I prefer fresh over dried for most recipes. 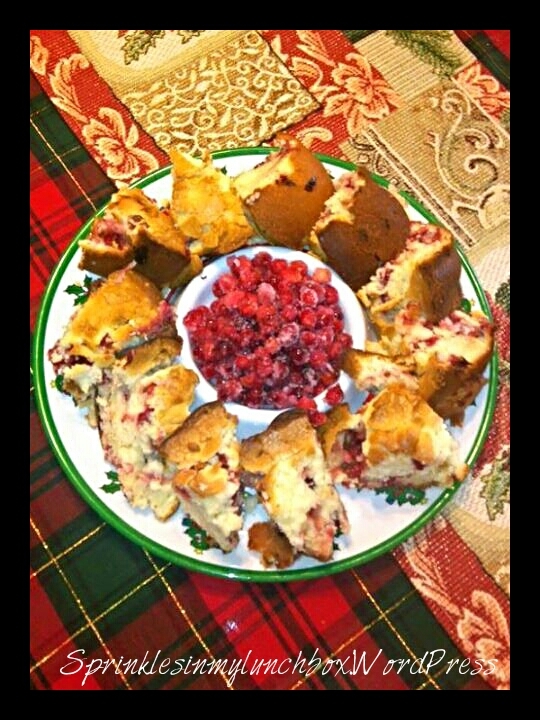 This Cranberry Cream Cheese Bundt Cake was divine. I served it sliced with Sugared Cranberries in the middle. I love those things. I could eat the whole lot. 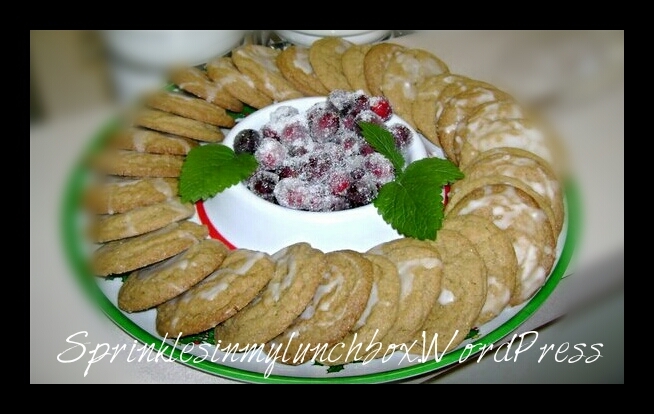 Here is another presentation where I used the Sugared Cranberries. I added a few sprigs of fresh mint. I love love love fresh mint. 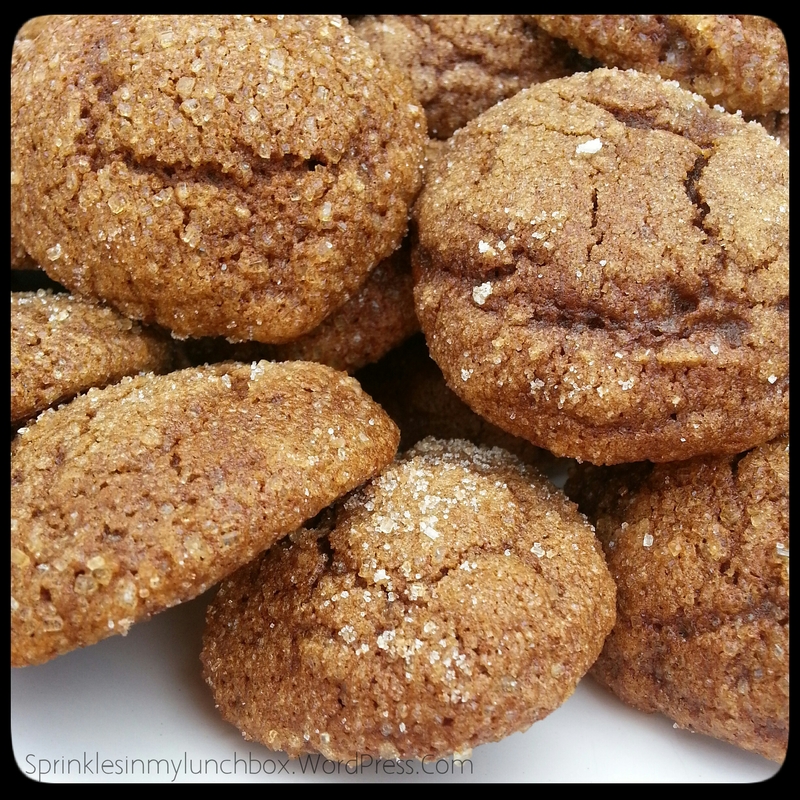 The cookies are soft, chewy iced ginger cookies. I actually don’t have a favorite recipe for this one. I seem to lose the recipe each year, having to search out a new one. I like them chewy, not hard, and soft, but not crumbly soft. But…I’ll eat any kind you place in front of me. Now, these…these were simple. I made boxed brownies (before I was super “daring” and made my own) and used a Christmas tree cookie cutter. I then made a simple icing sugar glaze and added green food coloring. 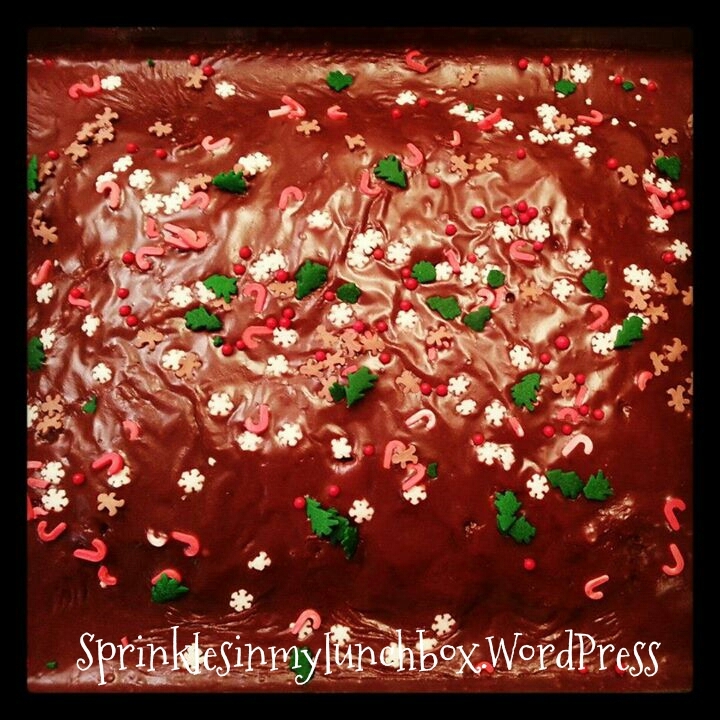 After spreading that on the trees, I added red sprinkles and a teeny white star sprinkle atop each tree. 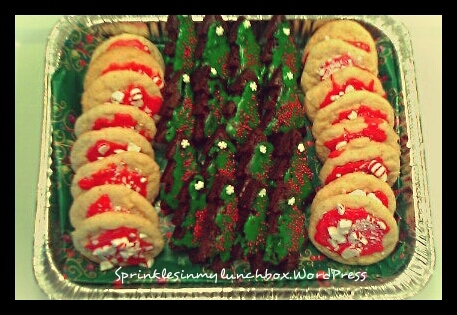 For the cookies, I added peppermint extract to a boxed sugar cookie mix and used the same glaze as the trees (only with red coloring) and added crushed peppermints on top. This was easy. Not gourmet. I’d like to think I’ve come a long way. But this is still cute if one is in a time crunch! 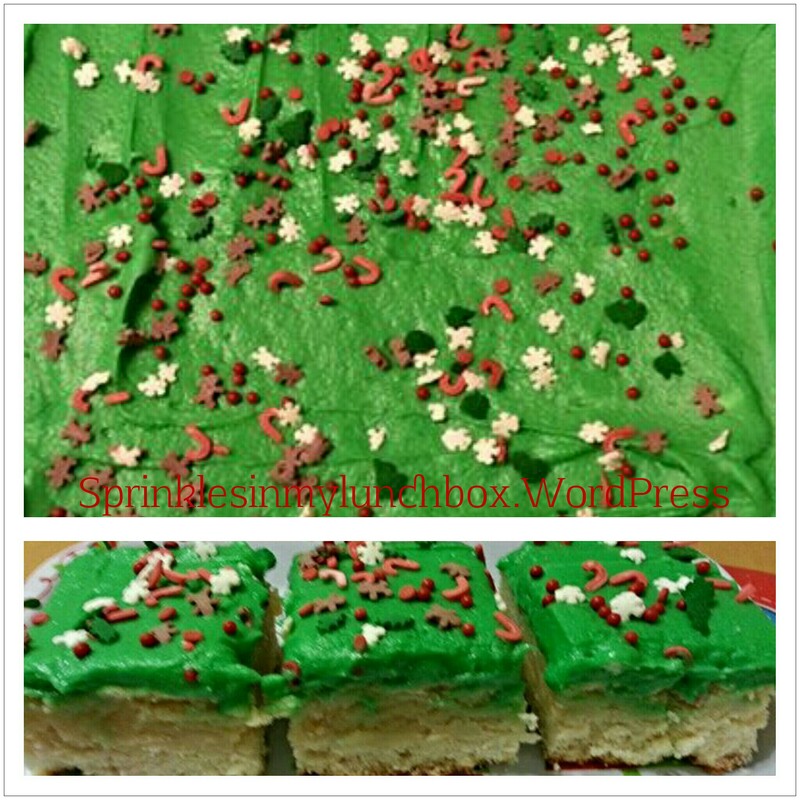 Staying in the cookie(ish) family are these lovely Lofthouse Style Sugar Cookie Bars. 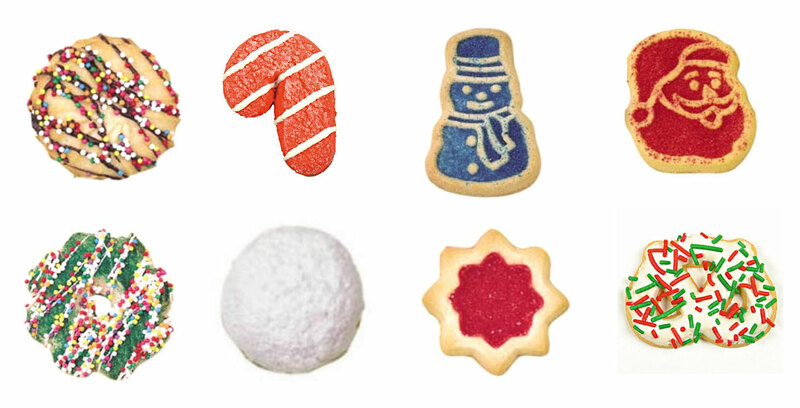 You know those frosted cookies you see (frosted to match the color of whatever holiday is near) in the front of almost every grocery store bakery, that are so oddly expensive and so ridiculously delicious and soft? Well, these are those. In a bar form. Like a whole pan can just sit on your lap and you can just use a fork. I mean, if that’s the sort of thing that you do. I don’t do that. Ever. 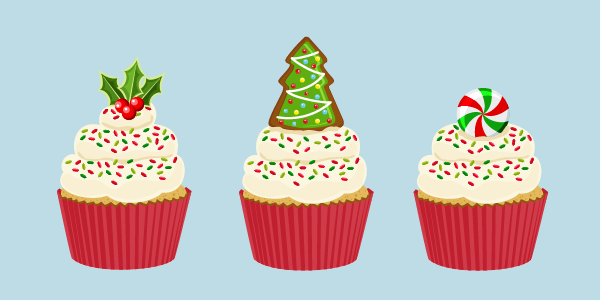 And lastly, for now of course, you can transform just about anything into a dessert worthy of the proverbial “Holiday Table” by adding festive sprinkles. They (I) don’t call me (myself) “Sprinkles in my Lunchbox” for nuffin’ (as Bigs would say)!! I found these adorable sprinkles (a mix made of Christmas trees, gingerbread boys, candy canes and snowflakes) at Ross. This is a simple Texas Sheet Cake (no favorite recipe, although, people…just you know, people, swear by The Pioneer Woman’s recipe).